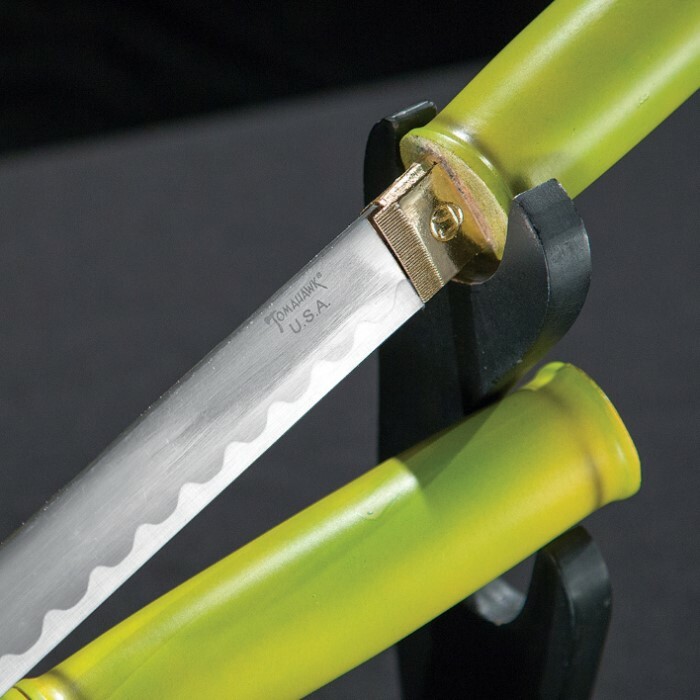 Bamboo Zatoichi Ninja Sword | BUDK.com - Knives & Swords At The Lowest Prices! 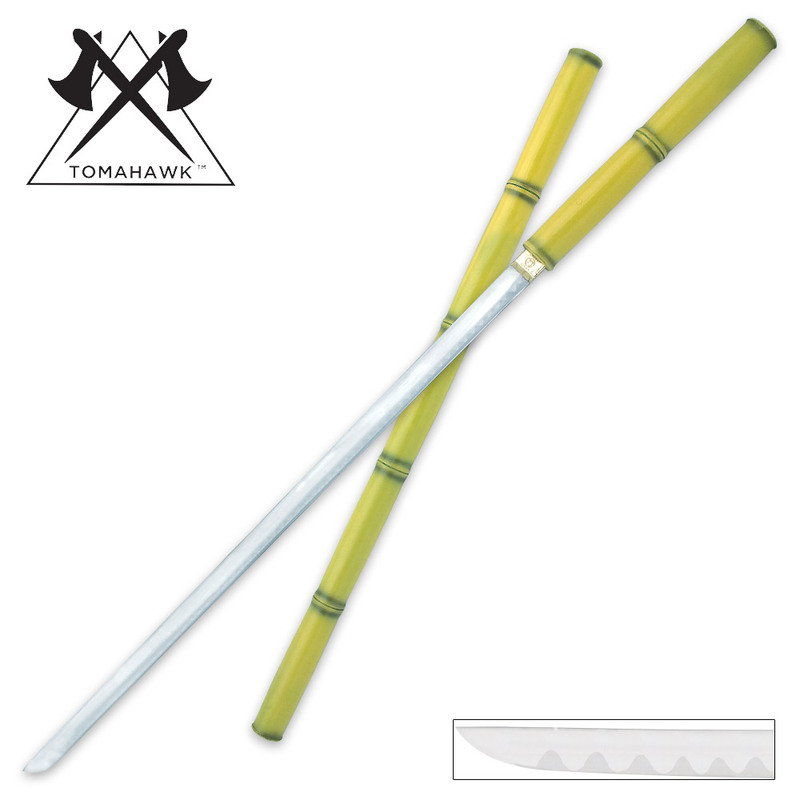 This imitation Bamboo Zatoichi Ninja sword combines the traditional katana blade shape with the ever popular sword cane design. It appears to be an oriental walking cane made of bamboo, but conceals a secret 27 1/4" carbon steel blade inside! It makes a great home decor item! Bought this for a hiking staff. Have another Tomahawk sword that was given to me by a student. They are coast effective (aka, cheap) swords. For $30 bucks I'm only complaining that it is dull as hell, more of a laito sword than anything. I do like it and will take it with me on field trips. I did sharpen it and am very happy with my purchase. Super fast shipping! Thanks, Budk! The sword is cool but needs to be sharpened if you plan on using it for protection or defense. I’m pleased with it overall. I bought it use as a hiking stick and since I am only 5'4" it works pretty good for that ,if you are taller it probably won't fit.However the sheath is soft and is starting to crack at the opening .I put a rubber tip for a chair on it to protect the end and this works well .I hated the ugly green color but paint is sold everyday and everything I buy I tend to customize in some way .All in all I have been pleased with this item and it is well worth the money as a project to customize and make your own. This is a nice hidden ninja blade in a fairly believable fake bamboo carved wooden stick. The blade is Marked "XL1086 carbon steel" "Handcrafted in China" and "Tomahawk USA" (1086 is a standard carbon steel, I have no idea what "XL" means) The color came more green than yellow, not much like the picture. It is fine with me, but I should mention it in case yellowish green doesn't go with your decor. To me It doesn't look much like a walking cane , but in propped in the corner in a vase with a fake cherry blossom branch, it passes for a decoration. If used as a cane,The wood is soft, and with no tip protection it would wear down quickly. You might be able to get a rubber tip for it. Even then, it is too long for a cane, too short for a walking stick. The biggest disappointment is that my trusty magnet says that is is nowhere near "full tang" as described. I would say it has a 4 1/2 to 5 inch tang in an 11 1/2 inch handle, which is less than half tang, and with no visible means of attachment, it is probably just glued in. I paid extra to have initials engraved, and they are a nice large size, but very lightly laser etched and not easy to see unless you get the light just right. As everyone else mentions, it has an edge, but sharp more like an ax, sharpened at 40 degrees, instead of sharp like a knife, sharpened at 15 degrees. I am sure it could be sharpened if you have the proper equipment, or lots of time and a big diamond file. This is the very 1st sword I've ever gotten. But, unfortunately, I'm returning it b/c of 3 reasons: 1 - The blade is duller than a butter knife. I cut my hand a bit trying to sharpen it. 2 - The bamboo sheath cracked. The sheath is so weak that I used is as a walking stick for less than a minute & it already looks like I traveled miles with it. 3 - The stick is too short. I can barely use it as a hiking stick & it would only take someone with a little bit of weapons knowledge to point this fake stick out. It was pretty fun playing with it. I chopped a couple of little branches, sliced a potato, & whacked a squash in 1/2. But still, meh. Looks cheep, very low quality, sword pictured is not same color as I received. I recently got one of these swords and I love it. The only thing about it is it isn't sharp at all. Other than that it is everything they claim it to be I love it. I bought two Zatoichis for defensive weapons to put around the house. The bamboo blends right in and no one notices them at all. I like the fact that the Katana blade is not that sharp. If someone breaks into our home, it will hurt more! I had this sword the total of 1 day and the paint on it began to flake and fall off. I feel bad to write a review like this cuz budk has been good to me so far. It was also dull where when I read the description it said sharp.